Håfa Adai (hello) and welcome to the official website of the Guam Visitors Bureau! Our mission is to provide you with comprehensive, up to date information for planning your trip to Guam. Known for our warm, hospitable people, Guam is a destination like no other. Only on Guam can you find star-sand beaches, crystal clear blue skies and world-famous sunsets. These are just a few reasons why millions of tourists have made Guam their top travel choice. Whether you're looking to experience a thrilling adventure on land or at sea, unravel 4,000 years of intriguing history, shop for the latest fashion and trends, taste our famous chicken kelaguen and red rice, or just wind down beneath some shady palm trees, Guam is waiting for you. Ready to learn more about our culture and find exciting things to do while here? Your adventure begins at visitguam.com! Find hotel, restaurant, event, and attraction information from VISITGUAM.COM, Guam's official visitor and vacation information website. 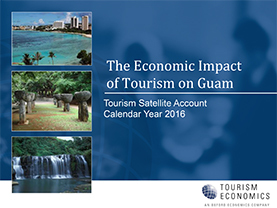 A strategic plan to transform Guam into the world-class destination of choice. Looking for RFP opportunities with GVB? View and download available RFP projects. Discover the benefits of connecting community with tourism. Guam.gov - The official portal for the island of Guam. Guamairport.com - A.B. WonPat International Airport, Guam's primary regional airport serving passenger and cargo needs between Guam and the world. Investguam.com - Official site for the Guam Economic Development Authority (GEDA).